Your webmaster is a part time student at Campion College, Australia. 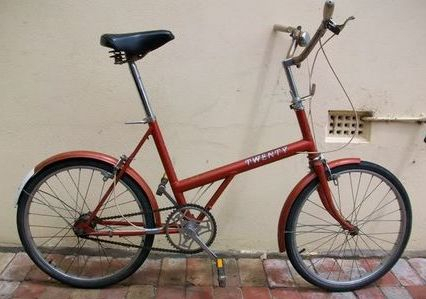 I am in my late 20's and was into cycling for about 12 months before acquiring a Raleigh Twenty frame and beginning the work to refurbish it. 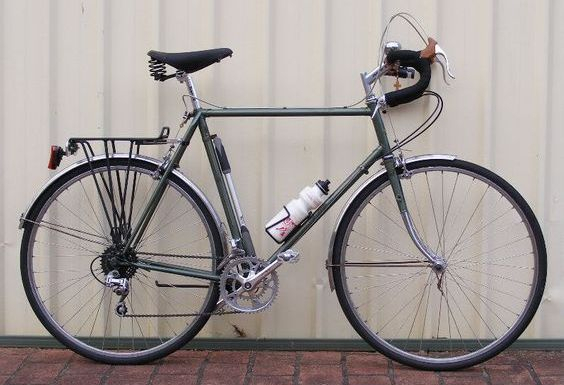 During my first months into cycling I began to volunteer at the Western Sydney Cycling Network's recycling program, where donate or collected old bicycles are mechanically overhauled and then given out on loan to members of the community. I do a mixture of commuting and touring by bicycle. I'm no racer and I will take a long time to climb hills. I cycle for many reasons, which include: leisure, fitness, being green, and out of the need for a cheap and reliable way of getting around. I now only drive the family car once or twice a week at most. "RADAR" - The one that started it all. "RADAR" - Really A Damned Awesome Ride! (Actually I just made that up on the spot). I figured that the personality of this bicycle reminded me rather much of Corporal Walter "RADAR" O'Reilly from M*A*S*H, being small, but sturdy, useful and ever-ready. The front forks and rear mudguard were given to me by a friend who was re-building his Raleigh Twenty as a speedster with suspension forks. I had plans to put an 8 or 11 speed hub into this bicycle, but for now I have an SRC3 3-speed coaster braked hub. I'm also deliberating whether to use the 1-piece stem and bars are to go with a 2-piece set that I recently acquired. I also acquired a brown non-folding Twenty dating from 1977. It has the larger but narrower ETRTO 451 rims. The tyres are 12mm narrower than the ones pictured above, and with the 3-speed gearing it is a surprisingly sprightly and nimble machine. I did very little to this Twenty. I added a round cat-eye red reflector on the rear mudguard, adjusted the handlebars and replaced the original Dunlop tyres when the wire bead finally gave up. The original tyres had the instruction "Inflate hard" moulded onto them. 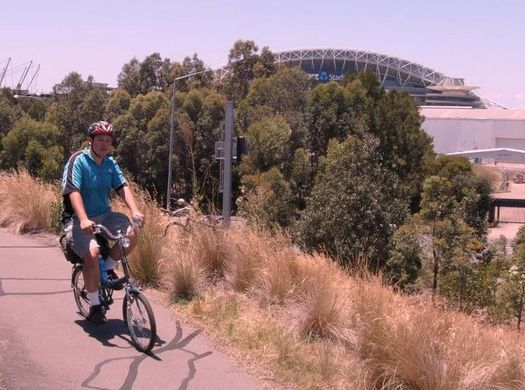 Riding at Sydney Olympic Park - December 2009. ANZ Stadium, in the background. I've found it better to alter the gearing by using a 16-tooth sprocket (off a discarded BMX coaster braked rear hub) on the instead of the stock 15-tooth sprocket. The spread of gears suits my riding style better, giving gears of approx. 45, 60 and 80 gear inches. It features in several other pictures on the website. I rode it in the 2010 Sydney Tweed Ride and the 2010 Canberra Tweed Ride. I also used it quite regularly for going all places locally. This bicycle was perfect for 90% of my needs. The only improvement I could have made would have been alloy rims. And I'm told that I really rock the tweed and bow-tie ensemble! I frequently used this bicycle on my mixed commute to university during 2010. The above picture more or less shows the final form that this bicycle took. 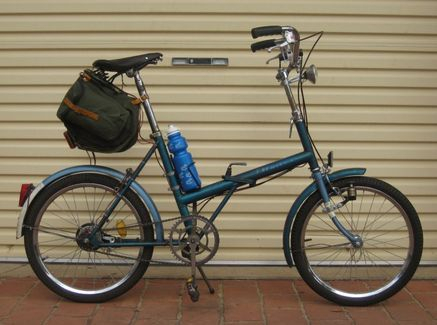 Still with original steel rims, although I did replace two spokes that I broke whilst in Canberra. New pre-aged Brooks B67 saddle, and the longer steel seat-post came from a Dahon Classic III folder which had a damaged frame. In 2011 I left Macquarie University and began attending Campion College. This bicycle was stolen from outside my College dormitory in late 2011 along with several other communal bicycles held on site. In 2012 a much more stringent security arrangement will be in place to prevent theft. I acquired a similar Raleigh Twenty, although somewhat worse for wear in January 2012. My new one differs in that it has a Sturmey-Archer Dynohubin the front wheel, and includes the original rear, rack, mudguard-mounted tail-light and reflector unit, the chainguard, the original grip-shifter, and the one-piece handlebars. It needs a bit of work as both the gear cable and the rear brake cable are completely seized. This one will be a parts donor - in particular the brown mudguards will help to "uglify" RADAR a little whilst I save up for components to rebuild it as a folding tourer. I also own a few full-sized large-wheel bicycles. Just to give you an idea, the above is a 23.5" 60cm Raleigh Royal, from 1982 - (My youngest bicycle - still older than me!) It has had a "sympathetic rebuild". The paint is all original and has a lovely patina about it. I used a mixture of vintage used and NOS items to build it up. It appears as an early-mid 1980's touring bicycle that has received modifications during it's lifetime. Basically, all the parts are period (or close to period). The use of the MTB-style stem was inspired by Sheldon Brown. I took it on a tour where the freewheel promptly seized on day 2, at exactly the half-way point. Luckily, I was able to hitch-hike out to the nearest township and then on to the next city where I was able to take a train home. I'm determined to complete the trip some day. The freewheel was replaced with one from IRD 14-32 6-speed. Honestly, I wish that they had put a 34 where the 32 is now. At the organ of St John's College, University of Sydney. I also do plenty with myself away from the bicycles. One of my life long passions has been church music. I hold no formal qualifications as such aside from several years of piano tuition from the age of about 8 to 16. 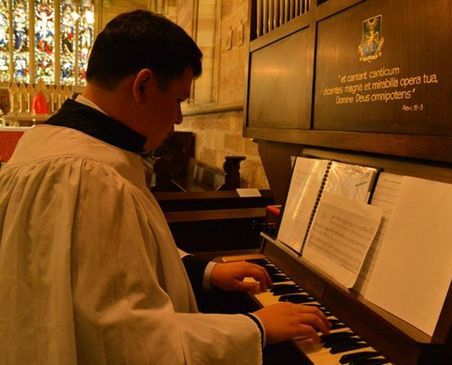 I was largely self-taught, and in more recent years I was accepted by audition as a Tenor in the choir of St Patrick's Cathedral, Parramatta (west of Sydney). I love to play the organ, specialising in repertoire for small pipe organs. I dabble in lots of genres of music, but mostly stick to English and French Baroque, with the occasional outing into German, Spanish and Italian music. Basically, if I find it useful for liturgical worship or just happen to like it, I find a place to use it! 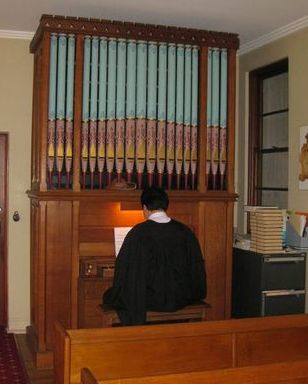 Playing the Campion College Chapel Organ. I've been an on/off part time student at Campion College since 2011. In that time I have often enjoyed playing the chapel organ for various services held there. This is perhaps my favourite small pipe organ. This lovely little instrument makes quite a merry noise. I could spend hours playing it, but the window on the right leads to the stairwell, which leads to one of the dormitory wings, and I've been in trouble more than once for playing it late at night! 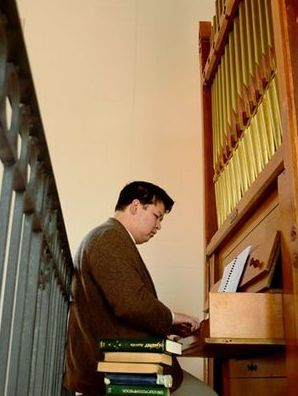 Playing the St Benedict's Retreat Centre Chapel Organ. I had the privilege of playing for the dedication of this small organ in the new retreat centre chapel. Another fine example of a small pipe organ. Yes, it is a tight squeeze between the gallery railing and the instrument, not helped by my plentiful girth! (More cycling should help fix that though). I seem to be intensely concentrating on that particular piece of music!